WHY? The most important questions anyone can ask are: Why was Jesus Christ crucified? Why did he suffer so much? What has this to do with me? Finally, who sent him to his death? The answer to the last question is that God did. Jesus was God's Son. The suffering was unsurpassed, but the whole message of the Bible leads to this answer. The central issue of Jesus’ death is not the cause, but the meaning—God’s meaning. That is what this book is about. 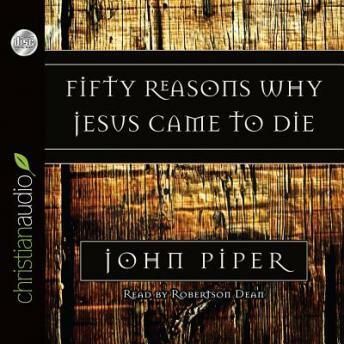 John Piper has gathered from the New Testament fifty reasons. Not fifty causes, but fifty purposes—in answer to the most important question that each of us must face: What did God achieve for sinners like us in sending his Son to die? Excellent work. It's amazing how one can look at the cross from so many angles. The beauties and the horrors of the death of Christ presented in 50 short but very rich chapters.